For the first time, room-size installations will open the exhibition season in both of the Purdue Galleries spaces. Art & Design faculty members Dr. Elizabeth Menon and Prof. Charles Gick and guest lecturer Rosanne Alstatt served as jurors for the exhibits, reviewing proposals from artists across the nation. Brooklyn artist Makiko Miyamoto will present a trio of room-size meditative installations in the Ringel Gallery. 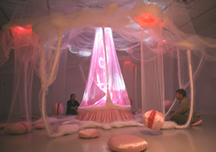 The otherworldly environment she creates features soft veils draped from ceiling to floor, shaped cushions, overhead video projections and sound. The sensual and tactile forms encourage a physical sensitivity and a thoughtful awareness of the living body.